Tenjin was founded on the principle that data clarity, accuracy and flexibility are absolute necessities for app developers looking to optimize User Acquisition and App Monetization campaigns. Toward that end, we continue to innovate the Tenjin platform and push the boundaries of mobile marketing. Our marketing infrastructure took another step forward this week with the launch of several important new features: new Advertising Monetization Reports, a new Ad Monetization Data Exporter, and a new Ad Monetization Reporting API. Collectively, these features help app developers understand their ad monetization better and get a clearer picture of the impact it has on their user acquisition efforts. Optimize ad monetization more effectively: maximize eCPM and ad revenue by knowing how each ad network performs in your apps' ad placements. Optimize user acquisition campaigns by making better marketing decisions through ad LTV and better trueROI estimates. If your apps are generating ad revenue, you can see a new tab at the top of the Tenjin dashboard called "Ad Monetization.” These reports contain important ad monetization metrics such as Ad Revenue, Impressions, Clicks, eCPM, eCPC, etc. You can group the reports by the Publisher Channel, App, and Country to see your ad revenue performance across these different dimensions. 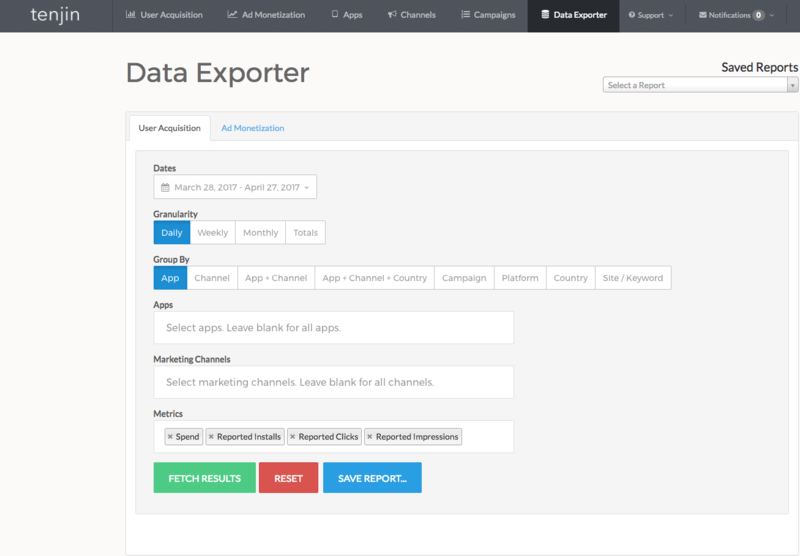 To extract the raw data from these reports, we improved our Data Exporter to include a new tab to request and extract all the raw data from the Advertising Monetization Reports. Finally, we have a new ad monetization reporting API that Tenjin clients can use to extract ad monetization metrics programmatically. Developers can use this API to quickly get their crucial ad monetization data from multiple publishing sources instantly. Using this API, developers and marketers can understand which ad networks deliver the highest ad monetization value, all from one standardized reporting API and system. They can pull all this data into their own warehouses for internal analyses, enabling them to optimize better through calculations of ad LTV by user acquisition source or by understanding which networks provide them with the best monetization in their apps. Understanding an app's ad revenue is crucial when calculating the trueROI that comes from user acquisition campaigns. Tenjin now combines accuracy in attributing IAP LTV and ad revenue LTV to the proper user campaign so that ROI is calculated precisely by acquisition channel. Tenjin is the only company that has this type of data and analysis across the board, and the combination of these improvements allows marketers and developers to better understand their user acquisition LTV and ROI performance.